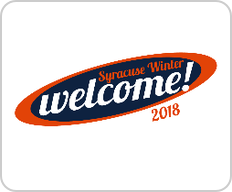 Winter Welcome is Syracuse University's mandatory new student orientation program and serves as the gateway to your Syracuse experience. During Winter Welcome you'll participate in academic, educational, and social programs designed to make your transition seamless and fun. These programs and events are for new first-year, new transfer, and returning Discover students and will prepare you for your classes, get you settled into your residence hall, introduce you to campus services and resources, familiarize you with University traditions, and enable you to meet your new classmates.